Based on London’s 1599 Globe Theatre, the open-air playhouse was constructed at the Fortress of Louisbourg by Walt Disney Studios for the motion picture Squanto: A Warrior’s Tale. After filming wrapped up, the structure was donated to Louisbourg and relocated to our site just off the main street of the Town. Since opening to the public in 1994, the Louisbourg Playhouse has presented hundreds of performers to thousands of visitors during our Island’s busy tourist season. We try to provide something for everyone, from our local residents to our welcomed visitors. 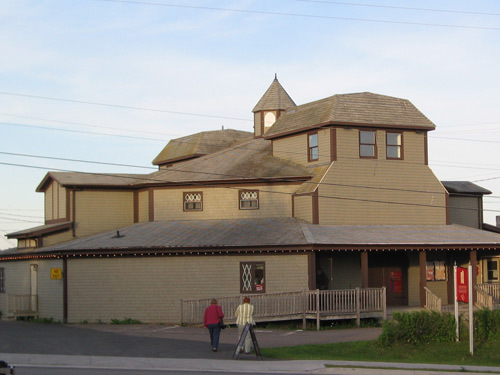 The idea of a performing arts centre on the site of the Louisbourg Playhouse originated in 1990 when the Town of Louisbourg developed a plan for revitalizing its downtown area. The plan noted the lack of evening entertainment for visitors to the town and recommended erecting an outdoor amphitheatre for the purpose now occupied by the Playhouse on Aberdeen Street.